Because I feel rather overwhelmed just now by the latent, and in some cases blatant, "We don't like your type around these parts," noises and "You're not from round here, are you?" murmurings coming from Rome, I feel it slightly incumbent upon me, as a Catholic parishioner of a parish Church in which both Rites of the Church are celebrated to defend those priests and parishioners who hold as sacred, that which has been passed down and held as sacred for previous generations. I guess you could say I am feeling 'tetchy'. We have a homeless man, young, vulnerable, with mental health problems, constantly neglected by the local authority, but who accepts with meekness his situation as a rough sleeper. He sleeps in a Brighton cemetery, his sleeping bag often battered by high wind and rain. He has family in the area, but things are difficult with family - though I do not know the details. He has been imprisoned for shoplifting sandwiches from local supermarkets when hungry. He recently spent seven days in Lewes Prison for failing to turn up to a probation appointment. He maintains that he wants to be baptised and has a strong faith in Jesus and too in Mary. After Mass today, he turned up in the pub across the road and sat down with us. By others, I am not talking of myself though I was present, this man was given generosity and greeted with love and compassion by both parish priest and parishioners and received from both priest and parishioners warmth, kindness and a listening ear. He was made to feel included and loved and walked away, having been offered food and given refreshments, quite a bit of money in his pocket to help him along his hard road ahead of him on a not particularly pleasant December weekend. I say this not to boast of the parish's very ample record of loving the poor and showing mercy to the outcast and the stranger, but simply to reaffirm that there is no contradiction between love for Sacred Liturgy and love of the poor. To me this seems obvious, but as we hear that liberation theologians are and were 'always orthodox' in belief, despite a certain horizontal dodginess that runs throughout such literature, it is becoming obvious that those who hold onto that which was sacred to previous generations are being quickly and unjustly labelled or pigeonholed into some kind of gang of hardline 'conservative' force that is mean-spirited to the poor. Of course, this is just one incident in what is a common theme at the Church that I attend of constancy in service to the poor, one example of which is the Soup Run to the homeless that feeds the poor every night 365 days a year. 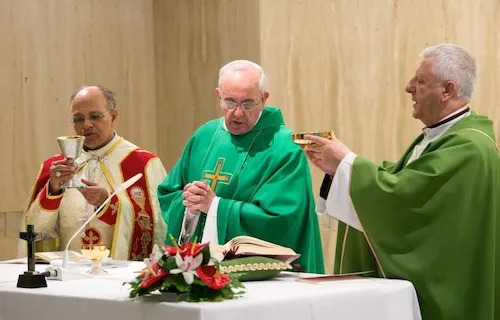 There simply is no contradiction between being desirous of liturgy that directs our hearts to Jesus Christ in the Holy Sacrifice of the Mass and that magnifies His Most Sublime Sacrifice and being open-hearted and compassionate to the poor. I would like to 'nip this one in the bud' as soon as I can, but I have a feeling that it may in time be a slur that comes in the direction of those who uphold dignity and reverence in both the modern Roman Rite and the Mass of Ages. Of course I am but a 'peripheral' blogger, with a very limited audience, but let it be known now that if this kind of thing comes from Rome, and accusations start being banded around that traditional Catholics (aka 'crypto-lefebrevists') are indifferent to the poor and the outcast, that this is a fabricated and malicious lie from the Father of Lies. Neither is there any reason to think that indifference to the reverence and dignity of the Sacred Liturgy automatically translates into care for the poor. In fact, those who use or abuse the Liturgy to suit their own personal preferences are, in my honest opinion, far more likely to use the poor for their own ideological purposes. well said - and since Francis First can say things like the blessed Virgin Mary told God he lied, and that Christ pretends, I think we should be taking what comes out of rome at the mo with a big heaping of what all the other Popes and Roman Catholics for centuries said, just to bring a little balance. 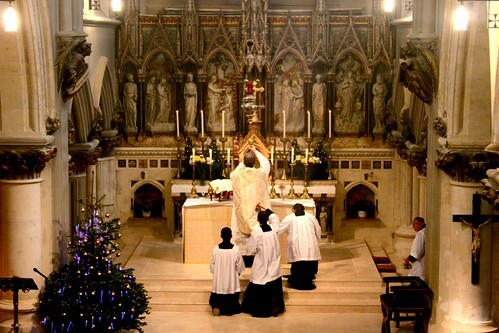 it would seem that slack liturgy, worldly homilies, the banishment of liturgical attire and men from the sanctuary (barring the priest of course, but who, knows? priestless liturgies with consecrated hosts is big in slack-liturgy land) is the shield of valour for humble catholics. I look around sometimes and wonder what on earth parishes are doing with all the money they're saving on the liturgy. Thank you for a post which shows that there is no contradiction between a beautiful liturgy and the beauty of loving our neighbour. How can there ever be a contradiction ? And thank you for your blog. A happy and a holy Christmas. Are you sure he's not just saying he wants to be baptised so you're more generous to him? I have been studying the missions history of the Church for three years now, and from what I could gather as a layman in both senses of the word was that it was desired in the good ol' days of the Catholic missions that the liturgy be very splendorous while ministering to the new Catholic communities, some of which were literally dirt poor. The Jesuits held great festivities in their reductions in Paraguay. When it was reported in the German missionary magazine, "die katholischen Missionen" that a Jesuit priest in India was too poor to furnish his chapel properly, people had pity on him and sent him money. Corpus Christi was celebrated with great splendor in Tahiti. In Tonga the missionaries even borrowed canons from the king to fire salutes for Christ the King. And Pope Pius XI. of blessed memory gave out the missionary prayer intention for August 1937 that the pagans may be drawn to the Church by the splendor of the liturgy. I believe the price of felt has gone up in recent years. There probably isn't any money being saved.